Colman Andrews, 67, could be among the old curmudgeon class of food writers. 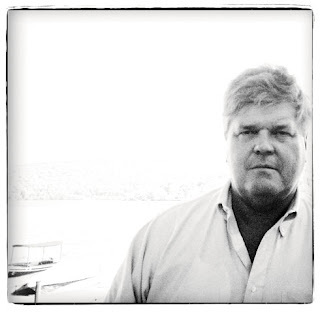 He could have gone off to pasture with his 6 James Beard Awards for food writing when Gourmet magazine folded in 2009, ending his stint as restaurant critic. Instead, Andrews is now editorial director of TheDailyMeal.com, a website that is as modern as food media gets -- and I don't mean that as praise. Like the Huffington Post, the Daily Meal doesn't pay writers, which means it runs a grab bag of mostly crap, often with hidden agendas. I clicked on a wine "story" to discover it was posted by a retailer looking to sell its wares. It's an interesting change for an interesting man, who co-founded Saveur magazine, is considered an authority on Catalan cuisine, and has written eloquently for just about every publication that runs thoughtful articles about food. 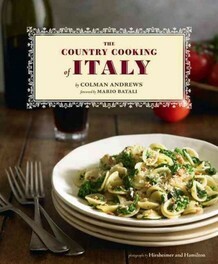 Andrews is coming to Oakland on Sunday to promote his new book, "The Country Cooking of Italy." This is a big deal as cookbooks go because his last book, "The Country Cooking of Ireland," took the James Beard Award in 2010 for Cookbook of the Year. Andrews will host a dinner at Camino restaurant: four courses with wine for $85. Seats are still available. WBG: What's the goal of the The Daily Meal? Andrews: The ambition is to be the clearinghouse for anything you'd want to know about restaurants, wine and spirits, beer, or anything related to those areas. We publish a lot of original material but we also publish a lot of links to other places. WBG: Do you pay writers? Andrews: No, in general we don't. The majority of our contributors have their own blogs or websites. We're a high traffic site, with 2 million monthly unique visitors. WBG: You built your career by being paid to write about food. Don't you feel guilty? Andrews: I can't say it bothers me because it's a different world. There would have been no value when I was starting out in telling people to write for a newspaper and say, write for us and your name will be better known down the road. I would say, no, I have to get paid. Today people get paid in all kinds of ways. Look at musicians who give away a download of their song for free, hoping that you'll download the album. The concept of giving something away for free in hopes of some future advantage is well-established. Anyone can start a blog. We just did a story on the website about the best bloggers' books of the year. Look at "Julie and Julia." She put a lot of work into that, a lot of work for free, and ended up with not only a book but a Hollywood movie. WBG: Do you worry about what agenda somebody might have when they write for you? Andrews: It's pretty obvious to us if something is undisguised propaganda for a product. It's one thing to run the official Butterball turkey recipe. A different level would be if you had something from Monsanto extolling the benefits of GM crops. That we wouldn't run, or if we did run it, we might run it so we can tear apart its assumptions. Part of the deal is that anyone can write anything and post it on our site. The trick is that nobody will ever find it except the person who wrote it and people they give the URL to. It might come in as item number 485 in a search. WBG: Don't you miss more erudite food writing? Andrews: At Saveur, it was a very different kind of article. It's like the difference between repairing sports cars and playing the piano. WBG: Do you think social media and sites like yours are affecting the food we eat? Andrews: The professional critic, as an entity, hasn't disappeared, but is much less influential and in some cases has even been discredited somewhat. People under 30 go to Yelp. Slightly older people go to Zagat. That is a tremendous change. Speaking as someone who has made a living writing about food, I find Yelp to be pretty useless. Reading this incredible mix of opinions from so many different kinds of people, I don't find it useful. Has it affected the quality of food? It's possible that it has. Especially on the higher level, the restaurants with more ambitions, maybe not having professional critics with some grounding in the history of food, maybe that has harmed those kind of places. WBG: Let's say you're going to Tampa, Florida tomorrow and you want to find a restaurant. How would you do it? Andrews: I would call people I know who have been to Tampa. I would probably just go to Bern's and have a steak and a bottle of wine. But I know a lot of people who live near there. I know restaurateurs I could call and say, Hey, I'm going to be in Tampa, where should I eat? I wouldn't use Yelp. I wouldn't go to a crowd-sourced critique. The other thing I like to do is look at menus. You can tell a lot about a restaurant from a menu. WBG: What do you look for in a menu? Andrews: I look for a lack of pretension, a lack of buzzwords. I look for food that sounds interesting. I look at some menus and I don't see a thing I really want. If you see cute language on a menu, that's a bad sign. If you see "prepared according to the chef's whim," I'd probably go the other direction. I'd to to the Sonic or the Dairy Queen. WBG: You wouldn't literally go to Dairy Queen, would you? Andrews: One night I found myself in a small town in east Texas where the only things open were a McDonald's and a Sonic. We went to Sonic and had jalapeno poppers. WBG: What's your favorite thing to eat right now? Andrews: I always say Tex-Mex. Even here in Connecticut of all places, there's a young couple who opened a food truck doing tacos. WBG: What's the sign of the apocalypse in food for you? Andrews: I always want to bring out the crucifix and the stake to drive into the heart of somebody who brings out balsamic vinegar and truffle oil. People who pour truffle oil on food are the same people who put ketchup on everything. WBG: Is there anything you miss in restaurants from the 1970s? Andrews: While food has gotten better, the restaurant experience has not gotten better. Restaurants used to be run by restaurateurs. You didn't know the name of the chef. You knew the front man. They were there every day, they knew something about food and how to set up a dining room and make people comfortable. If the chef left, the food stayed the same. I can think of a very good restaurant in New York opened by a chef. Then he opened a second one and the first one wasn't as good. Now he has four restaurants and I don't go to the first one anymore. WBG: Tell me about your new cookbook and why people should buy it. Andrews: This is one of probably 500 Italian cookbooks that came out last year. What I tried to do was bring to the fore a lot of Italian food that people hadn't seen before. What we know of Italian food in America is very limited. We've probably only got a few hundred dishes. Every region in Italy has a few hundred dishes. Every time I go there I find dishes I haven't heard of before. WBG: Tell me about one. Andrews: The biggest revelation to me was a dish I had near Catania in Sicily. It's called ripiddu nivicatu. The name means "snow-covered volcanic ash." It's a black risotto, with cuttlefish ink. It has on top of it bright red tomato sauce that's supposed to represent lava. It has hard cheese grated on the top to represent snowfall. It's unusual because Italians never eat cheese on seafood. It's a very dramatic-looking, theatrical dish. And it's delicious. Andrews graciously shared the recipe, posted below. Click here for tickets to the Camino dinner. Fresh cuttlefish is difficult to find in the U.S., and when it does end up in fish markets, it has usually lost its ink sac. Squid makes an adequate substitute for cuttlefish, though its flavor and texture are different. Bring the stock to a simmer over low heat. Melt the butter in a large pot over low heat. Add the the onion and cook, stirring frequently, for 6–8 minutes, or until it softens. Add the rice and cook, stirring constantly to coat it thoroughly in butter, for about 4 minutes. Add the wine and cook, stirring constantly, until it has evaporated. Stir in the cuttlefish ink. Ladle about 1 cup of the stock into the rice and stir it constantly until the liquid has been absorbed, 2–3 minutes. Repeat the process several times, continuing to stir constantly, adding stock only when the previous stock has been absorbed. Cook until the rice is done but al dente, another 5–10 minutes, adding more stock as necessary. When you add the last portion of stock, add the cuttlefish and stir in well. (You may have some stock left over.) Cook for 2 minutes, then season generously with salt and pepper. While the risotto is cooking, heat the tomato sauce in a small saucepan over medium heat. Stir in peperoncini, then reduce heat to low. To serve, divide risotto between 4 to 6 warmed bowls, then top each with some tomato sauce, dividing it equally among them. Crumble ricotta on top of each serving of tomato sauce, again dividing it equally. Great questions, and illuminating and helpful answers, until I got to the two packets of cuttlefish ink. How big is a packet and where in California would I find a couple? Where to buy it: Asian grocery stores carry squid ink. Italian specialty shops do as well. Will try to find out from Colman how big a packet is. Mike: Colman says the standard packet size is .14 ounces. I added it in the body of the recipe. He also says that even though most packets say "squid ink," they are actually cuttlefish ink.